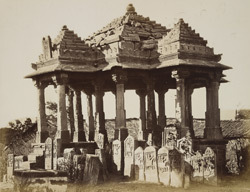 Photograph of a group of paliyas (memorial stones), with a tiered pavilion (chattri) behind at Than in Gujarat, taken by James Burgess around 1874. In the 'Report on the Antiquities of Kathiawad and Kachh of 1874-75', Burgess wrote, "Throughout the country and in Kachh, the custom long prevailed of erecting a stone called a Paliya to the memory of those who died a violent death, but in more recent times it seems to have become common also to those who died from natural causes. Like grave-stones in other countries they are of very varied workmanship, from the plain stone with a rude symbol above and the name, date, and mode of death...to the moulded stone surmounted by a figure of the deceased mounted on a horse or camel...These paliyas are sometimes erected on raised on raised platforms, and in rarer cases they are covered by a pavilion or chattri."